Yesterday was quite a stressful day because of the earthquake we experienced here, on the East Coast of the USA. Honestly, I didn't feel anything! I was driving when it happened, and as I was driving I saw people pouring into the streets. Thank God, no injuries or damages were reported but the entire city went crazy and the traffic was insane. Вчера был нервный день из-за землятресения, которое произошло на восточном побережье США. Честно сказать, я совсем ничего не почувствовала! Я как раз была за рулём, поняла, что что-то случилось, когда увидела толпы людей на улицах. Слава Богу, ни жертв, ни разрушений не было, но весь город словно сошёл с ума, и пробки на дорогах были ужасные. Great skirt! Only $7500? Well, I'm glad you found it for $22 instead, which is a good price for any skirt! That leather skirt is a beauty! And such a steal of deal, too. wow what a deal on the skirt!! i like this look alot!! love how you paired the skirt with the blousy top and belted it...flawless!! I never thought a leather skirt can look so classy and stylish! You are such an inspiration! Don't you just love Forever 21? They always have the best deals! Glad to hear everything was fine after the earthquake. They're pretty common here in California, but still get my heart racing whenever they decide to come out and play. very nice look!the skirt is so lovely! Очень красивый наряд получился! Юбка замечательная. Думаю, на осень подойдет просто идеально! Pretty lady! Love how you played with the proportions and colors kept on the same palette! 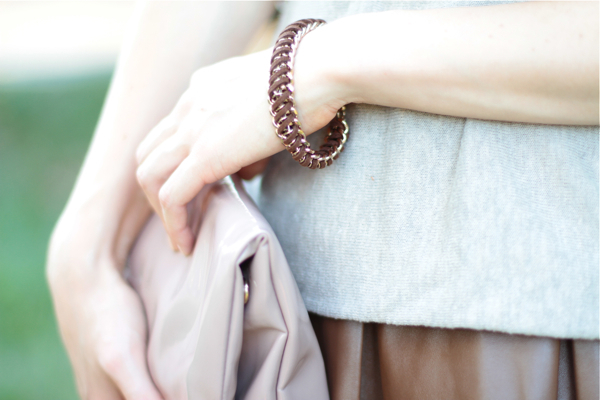 love that leather skirt and the neutral look! perfect preview for the upcoming fall! wow!! !i love this outfit! !i really love that skirt and bracelet. Cozy and warm ensemble! Bravo! Oh dear! earthquakes are the worst :( last year we experienced a 7.2 earthquake and a few people died :( i'm so glad to hear you're ok and you didn't suffer. Ohh, earthquakes are so dangerous and scary! I'm so glad you're OK!! you're stunning! i love your bracelet. Whoah i love the combination with this skirt, I also wanted to buy it but i didn't know how exactly to combine it! You look stunning. Rarely do you see a leather skirt so full and with gathers. I had one a very long time ago something like this. It gives off very flattering lines. . . Your skirt is really FAB! I love the way you have belted the top! i like the texture mix of the leather skirt with the softness of the blouse. beautiful look! i like this outfit! im definitely loving your bracelet! Lovely outfit and nice blog! I think just true fashionista can get finding for bargain price and You nailded it. This is beautiful, soft, feminine look and a bit edgy, because of leather skirt. The scenery of photoshot is wonderful. LOVE this look. the leather skirt is so earthy and natural looking. so pretty! The skirt is great! May I ask where did you get your clutch from? Thanks! oh my god! the perfect neutrals are gorgeous! love the outfit! you look adorable! follow me back maybe? Love this blog! I'm so following it now! You look amazing in every post hun! espeically love the leather skirt here! Check out my blog if you get the chance pls! brilliant browns :) great find with this skirt. can't tell it's faux at all! looks very feminin and beautiful.